Der Debattierklub Wien war am letzten Märzwochenende 2012 beim Dutch Open in Leiden zu Gast. Stefan Zweiker hat eine unterhaltsamen Text darüber geschrieben, den wir Euch natürlich nicht vorenthalten wollen. Assume you receive an email on a Monday at about 1am offering you a team slot at a good tournament in the Netherlands, which starts off 4 days later. What would you do? The correct answer is looking up a flight of course. At for Melanie Sindelar and Stefan Zweiker who confirmed the slot immediately and thus hopped over to the Dutch Debating Open in Leiden, Netherlands (30th to 31st March 2012). Whether the trip was worth the flight and how Dutch the Dutch Debating Open really were can be read in this article. Later Winner Arielle Dundas in the final. Dutch Open was pretty Dutch indeed. Obviously the convenor was Dutch (Karin Merckens) and one of the CAs was as well (the Adj Core was led by Rogier Baart together with Becky West, Joe Roussos and Marcus Ewald). Next to contingents from Germany, Ireland, the UK and Israel, most of the teams were Dutch, too. As they luckily did not debate in Dutch, all that is definitely not a bad thing though. The Dutch stand for quality in the ESL category and one could notice that. There were heaps of good teams around, most of them already practising for the European championships in August. Out of the around 4o teams competing, the final was won by “Really can’t be bothered to be creative” with the VIV12 finalist Arielle Dundas against two English and another Dutch team. Also the quality of adjudication was very decent; at least we clearly agreed with the call of the two debates we won. Less Dutch but more Viennese was the DKWien contribution on the tab as team “Closing Opp”. Despite the name we did debate all positions in of a BP debate throughout the rounds. After a fourth and a third on the first day, Saturday’s performance was satisfactory with 2 consecutive wins and a deserved fourth in the last preliminary round. We are still not sure what the word fabricate actually means but we obviously did not get it right in round 5. That made the result somewhat understandable. Finally Closing Opp ended up with 7 points on the record. Late night express between Leiden, Den Haag and Amsterdam. The Netherlands are one of those few countries in the world that are small even from an Austrian point of view. Thus the cities Leiden, Den Haag, Amsterdam and actually Utrecht and Rotterdam as well lie very close to each other. Moreover they are well connected by train (if they go). So it was normal for all the attendees of the Dutch Debating Open to commute by train to The Hague or Amsterdam for the crash place. The early worm is caught by the bird. 6:45am is simply not a time to be awake. Early morning ride between Den Haag Holland Spoor and Den Haag Centraal. Albeit crash was generally well organised and very decent compared to some north Atlantic island’s standards that thing did not always work out for the Viennese team. Actually it was very nice of the organisers on Thursday night, even though the tournament had not started yet. Since the floor, seats and couches of our crash person’s apartment was already fully covered with the bodies of sleeping debaters as we arrived, we got to sleep in the common room of the container-style apartment house. That seemed to be a good thing as it was a quiet place equipped with comfy couches. Unfortunately the luck with the place only lasted till 6:00 am sharp in the morning. Then the security of the complex is to blame for kicking us out. Being deprived of the sleeping after a 3h nap was a reason enough to take an early train into the centre of Den Haag. Hence, we can share an important piece of information about the hotel at Den Haag central station. They have 4 stars and let you check in at 7am while hostels don’t. Indeed, there’s stuff to see in the Netherlands. Heaps, if you count each bicycle as a single attraction. Another good thing about the Dutch Debating Open was their very compressed and efficient schedule. We had plenty of time to check out Den Haag and Amsterdam on the days that did not run debates. 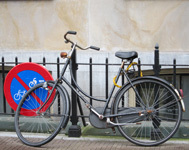 The Dutch cities have merits far beyond different kinds of two wheeled means of transportation. Amsterdam’s Pancakes deserve recommendation, there’s the usual touristy stuff and a lot of narrow channels to see. Hence, the spare time on the debating weekend was also enjoyable. 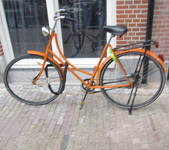 To sum up the article there is (1) a row of bicycles (see above) decorated with a picture of Melanie posing behind cheese and (2) the conclusion that the Dutch Debating Open were absolutely worth the trip. Well organised, good teams and something to see around, would go there again on short notice. According to the level of debates this was definitely a debating tournament even though tourists would find the also region interesting. Food was provided and usually crash was supposed to be decent, hence we do not complain about subsistence. The field was somewhat international but probably not comparable to the 20 nationalities we had at the Vienna IV. The OrgCom did a good job, especially in running the tournament on schedule. 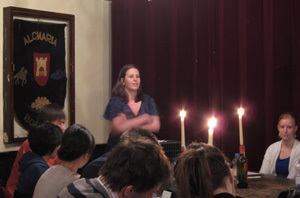 General: 30th to 31st March 2012, 5 Rounds, BPS, 7min Speeches, Break to Semis, Novice Final; CAs Rogier Baart, Becky West, Joe Roussos and Marcus Ewald; Winner: “Really can’t be bothered to be creative” (Heleen van‘t Spijker and Arielle Dundas). More Infos can be found on a Dutch debating website [nl-nl]. Hier gibt es einen unterhaltsamen Text vom DCJG Mainz über das Turnier. Hier gibt es auch ein Meldung vom Debattierclub Aachen zum Dutch Open.